We like butterflies because they are pretty and don’t bite. The rest of the insects eat our crops, give us diseases, and bite us. They fly in our faces, food, and windshields. If we took a poll, probably most humans would like to have an insect-free world, – but be careful what you wish for. A new study shows insect numbers in parts of Europe have crashed just since 1990. The paper is titled “More Than 75 Percent Decline Over 27 Years in Total Flying Insect Biomass in Protected Areas.” It was published in the journal PLOS, on October 18, 2017. Our guest is Dr. Dave Goulson. 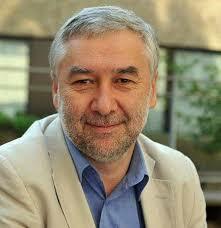 He is a Professor Of Biology at the University of Sussex in the UK, and head of the Goulson Lab. He is a co-author of the new study, which has generated some alarm and worrying headlines. 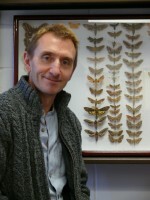 From the deep south of England, we welcome Dr. Dave Goulson to Radio Ecoshock. This story is SO alarming! It spread quickly through social media and major newspaper coverage. But don’t rush to call this another climate change extinction. Certainly weather disruption can be hard on bugs, but Goulson suggests things like pesticides from nearby agricultural fields in Germany are a factor. We are also paving over so much of nature, or taming it into farming, that we removed insect habitat. When they cross-checked insect decline in these German cases with weather records, it doesn’t appear climate change is the main factor, Goulson says. Dr. Goulson is also an expert on bees, so I ask him if the mystery of bee colony collapse has been solved. Again he says pesticides loom large, but we may never know the whole reason behind the die-off of so many of our precious bees. This study only covered flying insects, but it turns out the majority of insects do fly, or at least could fly. The study was only possible because insect-lovers in Germany had the patience to set up traps for flying bugs every year for 30 years, and carefully count what was captured. It’s even more disconcerting that such a huge disappearance of flying insects happens in nature preserves, in Germany which tends to be serious about nature preserves. Nowhere is safe. We talk about whether the German loss is reflected in other parts of the world, but the needed studies have not been done. We do know about disappearing bees. People are talking about fewer bugs splatters on their windscreens than in previous years. But we don’t know for scientific certain. Is it possible we could be entering a mass extinction of insects and not even realize it? In the last few Radio Ecoshock shows I’ve talked with scientists who explain the huge role forests play in either regulating or changing everything from weather to climate. But imagine a world without trees… and then their first arrival. A team of scientists have painstakingly analyzed the remnants of ancient trees. Nature’s first attempt to build tall living towers from carbon was difficult and strange. Trust me, trees changed Earth more than you know. Answers have just been published in the Proceedings of the National Academy of Sciences. 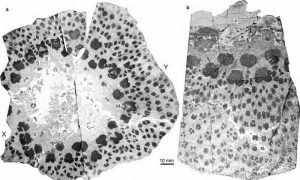 The title is “Unique growth strategy in the Earth’s first trees revealed in silicified fossil trunks from China”. The lead author is Hong-He Xu from the Chinese Academy of Sciences in Nanjing. Our guide in this program is co-author Dr. Christopher Berry, Senior Lecturer in Palaeobotany at Cardiff University in the UK. Before we get to his latest science which has landed in major newspapers, I step back to a previous stunning article that Chris co-authored. I’m talking about the 2015 paper whose title starts out “Investigating Devonian trees as geo-engineers of past climates…” The lead author on that one is Jennifer Morris from Cardiff University. That earlier paper said the mineral changes brought in the soil by tree roots ultimately caused, quote, “a 90% decline in atmospheric CO2 levels through the Palaeozoic.” With the warming gas CO2 tumbling, did early trees create the conditions for an ice age? But even with such a stunning carbon loss, the ice age did not happen. Chris speculates this may have several reasons, including the way trees added a darker color to the Earth, thus absorbing more sun (albedo change). Personally, I also wonder if the carbon dioxide levels started out so high at that time, that even a great loss left the atmosphere above the levels required for an ice age? Even so, we can see that the arrival of trees was a fundamental change to the operation of the carbon cycle, and the climate of Earth. Paleoclimatologists on Radio Ecoshock say Earth was in a warmer ice-free state for much, much longer than the recurring ice ages humans experience. Is it possible that the arrival of trees, with their larger demands, was part of the destabilization of climate, ever since? Chris has specialized in an ancient type of tree, now extinct, called “cladoxylopsids”. Their fossil trunks have been found in many places, including near the fossil forest in Gilboa New York State. But the real revelation came from samples found in China. These are not technically “fossils” because a different process left even the cell structure intact. That allowed the scientists to reconstruct the odd way these first trees developed. I won’t get into my philosophical thoughts about whether trees, or all complex lives, are really colonies rather than individuals. I do ask Chris Berry the Gaia hypothesis first presented by James Lovelock. Does life create the conditions on Earth needed for more life? You can read more about this new science here at phys.org, and here at Newsweek (with a short video of Chris Berry). In the first weeks of November, world governments will meet in Bonn, Germany to plan our reaction to the climate crisis. Called COP23, it is supposed to flesh out commitments in the Paris Climate Agreement of 2015. The conference is being ignored by North American media. Some citizens have not heard of climate change, a few do not believe it, and far more think the United Nations Climate process is literally too little too late. A new “Emissions Gap” report from the United Nations Environmental Program agrees. It says even if all the emissions cuts promises made at Paris are kept, which seems unlikely, the world would still warm by 3 degrees C by the end of this century. Scientists have called that level of warming “catastrophic”. Find the eighth annual United Nations “Emissions Gap” report here. Obviously, we need pressure from every level of society to do much more. Our next guest has helped draw together organizations of youth, environmental groups, trade unions, Indigenous people, women and business to put pressure on the governments in Bonn. Ronan Dantec is also the spokesman on climate change negotiations for the international organization called “United Cities and Local Governments”, [(UCLG)]. He is President of the Climate Chance Association, “climat chance”, – an organization of non-state actors calling for concrete action on climate change. Our guest Ronan Dantec has been a representative in the French city of Nantes. There is a lot we can learn from this “green” city. Nantes is considered a port city, although it is not directly on the Atlantic coast, but up the Loire River. Looking at a map, we might call it in northern France, but the French do not consider it northern. We can also learn a lot from the French effort to organize “non-state actors”. Surely we can’t leave climate negotiations up to world governments, many of which are not democratically elected anyway. Even in Democracies, climate action is lagging far beyond the reality. So we need to organize “the rest of us”. This U.N. list leaves out media, even independent media; artists; and notably churches, which are surly part of “the entire organised civil society”? Still, this is a huge list of players, all of them needing a voice at the Bonn Climate talks and beyond. All of these players were organized in Morocco in September 2017, under an agreement called “The Agadir Declaration”. You can read it here. By the way, the Bonn talks are supposed to be the technical meetings, prior to later conferences. It would have been less public I suppose, if Donald Trump had not withdrawn from the talks. It appears America is not sending representatives to Bonn. We’ve just learned that Syria has joined the Paris Agreement, leaving the United States as the only country in the world not promising to act to avoid dangerous climate disruption. In many parts of Africa, the European language of choice is not English but French. So France can help African states organize climate action. But outside a few oil and gas producers, these are generally low-emission countries who will be highly impacted by climate disruption. What can Africa hope to do in the climate fight? Northern Europe was just hit by yet another extreme weather event, this time a battering storm. Caribbean islands have been wiped out, and Houston badly damaged. What happens if populations become so bogged down in each disaster, there is little energy for larger climate solutions? People may already be in despair of any real government action to save us. The process seems so closed and boring. What happens if we ignore the COP meetings and climate summits? As always, I can use a little of your financial support to make this program. Stations do not pay for it, and I don’t bother you with advertising. It is listener-supported journalism with a touch of campaigning. Check out your options here. I’m Alex Smith. Thank you for listening, and please join us again next week for more Radio Ecoshock.